As we wait for one ex-coach to possibly face off against his old team, we've got one waiting for us in this evening's second game. 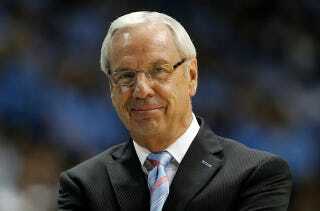 Roy Williams used to coach for Kansas before returning to his alma mater, North Carolina. In case you weren't sure, here's a little taste. Sadly for Roy, the feeling is not mutual.